The Akita is the largest of the Japanese breeds. In July 1931, the Government of Japan designated the Akita as a national monument and one of Japan’s national treasures. He has been used to hunt ducks, birds, small and large game, including deer, elk, antelope, monkeys, boar and bear. Today the Akita is most often seen as a loyal companion but, as a versatile breed, they can also be seen working as police dogs, therapy dogs, hearing and guide dogs, sled dogs, guardians, and hunting dogs. In addition, some are involved in herding, obedience, and tracking. In Japan, the breed is regarded as a loyal companion and pet, protector of the home and a symbol of good health. The Akita’s personality is very complex. He is very intelligent, extremely loyal yet independent, and has well developed guarding and protective instincts, making him an excellent guard dog. He can be headstrong and dominant in nature and requires early socialization and training. The Akita is well known for his loyalty and devotion to his family and, typically, is very gentle, protective and patient with children. However, as with any dog, supervision around small children is a must. The Akita is a large, powerful dog with a thick double coat and a tail that is curled and carried over the back. One of the most distinguishing feature of the Akita is his large head. That combined with the small triangular shaped eyes and small erect ears give the Akita a dignified and intimidating expression. Generally, the male Akita is substantially larger than the female. The double coat gives the Akita the typical northern breed appearance. The coat is short to moderate in length and very dense. The undercoat is very soft while the outer coat is slightly longer and coarser. 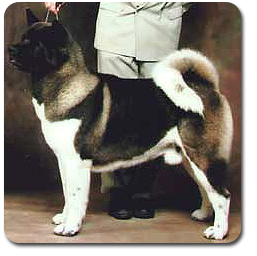 The American Akita tends to be larger and stockier than the Japanese Akita; any coat colour is acceptable including white, brindle or pinto; markings are well balanced and he may or may not have a mask or blaze (except for the white Akita who has no mask). The Japanese Akita is more refined than the American Akita and the only colours allowed are brindle, white, and red with white markings. Akitas, as with other breeds, are susceptible to some health problems, some of a genetic nature, others viral. The Akita Health Issues document includes information on some of the known health concerns found in the breed. Optional screening includes Elbow Dysplasia and Patellar Luxation. Canine Health Information Center (CHIC) — Akita Breeds Requirements — Providing a source of health information for owners, breeders, and scientists that will assist in breeding healthy dogs. CHIC is a centralized canine health database jointly sponsored by the AKC/Canine Health Foundation (AKC/CHF) and the Orthopedic Foundation for Animals (OFA). 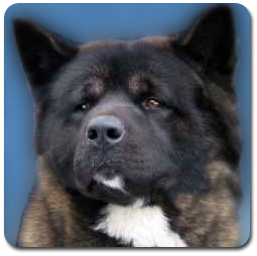 The Akita Club of America — Excellent resource for detailed information about the breed.